While looking through my blog book (see the previous 2 posts), I realized that I hadn't shared a few sights from our trip last summer. So, let's pay a very quick visit to the Tower of London. We walked along the opposite side of the Thames River for our first glimpse of this massive place. I could hardly believe I was there, in this place where so much history occurred. I've read history books and historical fiction since I was a child, and much of it was English. The building with the four towers in the photo is the White Tower, built in 1080 by William the Conqueror as a royal residence. Subsequent kings added to it. From the river, many prisoners entered the Tower via this entrance, now blocked up. What fear they must have felt going into this prison, knowing that the likelihood of their release was minimal, and highly dependent upon the whim of the current monarch. Among them two young queens - Catherine Howard and Lady Jane Grey (the Nine-day Queen). Anne Boleyn most likely entered through another gate. The Tower sprawls over 12 acres of land (5 hectares) and encompasses residential housing for the Yeomen Warders, who guard the Tower. Yeoman Warder Towell gave a great tour of the Tower. He is a wealth of information and kept us all moving through the grounds. One thing I learned was that very few executions took place within the Tower walls. Most occurred on a mound outside the walls. However, the three queens previously mentioned, along with a few other unfortunate souls, were beheaded within the walls, privately, and this glass memorial marks the spot. These bodies (and heads) were then immediately interred in the floor of The Chapel Royal of St. Peter ad Vincula without memorials. In the 19th century their remains were interred in the crypt. It is a solemn place to enter, and respectful quiet must be maintained. After the tour, we wandered about the walls and encountered this brave knight, about to take part in a reenactment. He is wearing chain mail. I asked him how much it weighed and he guessed about 50 pounds! That's weight-bearing exercise for you! These charming little patios, seen from the inner wall, belong to the Yeomen Warders who live on the grounds. We saw much, much more, including the magnificent Crown Jewels. If you ever get to London, the Tower is a must. History echoes in every stone. Thanks for the quick visit to the Tower, somewhere I'm ashamed to say I've never actually been to. It's going on the travel list right now. Happy Mosaic Monday, hope your week is great. My grandson went last year, on his visit from Vancouver. He found it fascinating and saw the jewels also. I love the little photo of the patios. Now I must go back, we missed the Tower of London. Thanks for a glimpse! Such an interesting post Lorrie......you always capture fascinating snippets of history for us. I haven't visited here for many years....must go and look again. You got some great photos too! Wonderful tour of the place. Fantastic shots. I've visited so many times - childhood school trips back in the 1950's (showing my age here!) to the most recent in 2015 with a granddaughter in tow. It's always SO interesting - something new is learned about its amazing history each time. Must admit I've never come across a guy in chain mail though - you were lucky to catch that great shot Lorrie. In the movies, I thing the actors are shown going through the Traitor's Gate. I didn't know about the Court Gate. A lovely tour of the Tower, Lorrie. We visited one day last summer too -- a splendid place full of history. 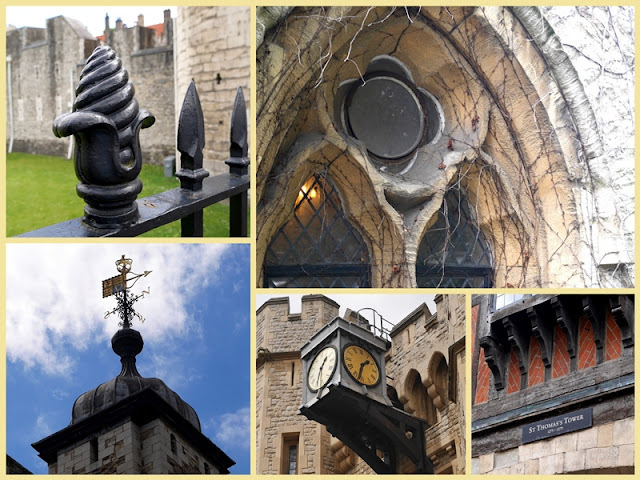 This is a wonderful photo tour of the Tower of London, Lorrie! It brought back great memories of our visits there, but you got some photos that I didn't, so it was especially fun to see these. Thank you. Isn't London the most interesting place! After our tour, we walked around to the back of the tower ( where we needed to catch our bus) and saw laundry hanging from a clothes line strung from the guards living quarters. Somehow, that is my favorite picture of the Tower ... it made me think about how the guards, in those days, would just have been going about their regular life, while history was happening and people were being beheaded by the shift that was working at the moment. (I loved everything about the Tower and thank you for the great memories.). Did you see the ravens? Thanks for the tour, Lorrie! I did a quick tour of London during a layover, but never had the chance to visit the Tower. This would be on my must do list if I ever get a chance to visit England! Wonderful shots from the tower. This takes me back. Just today, we read a bit about William the Conqueror and the Tower of London in our history studies, so this is timely for us. I must remember to show Bekah in the morning. Amazing how very old this structure is compared to anything in North America! This brings back memory. I visited years ago, it is a place so full of history. Beautiful photos, Lorrie, despite the macabre subject matter! Although the history gives me goosebumps, the architecture is definitely impressive, commanding more observation. Liberty and I visited London in the summer of 2005, but we didn't get a chance to tour its Tower, so thanks for taking us along your visit. A nice tour of the tower; imagine carrying an extra 50 pounds around on your body. Thank you for that visit. I will never forget standing in the Tower chapel that was used by William the Conqueror! I have visited the Tower a couple of times and like you felt in awe of the historic events that took place there. You've really made me think ... I should visit! I loved reading your post and looking at your photographs, thank you for sharing. Your photos are great Lorrie. Thank you for the tour to the Tower! hidden in all the beautiful buildings is something we hardly get here in our "young" country. I'm reminded of our trip to Italy a few years ago. I can tell you love history and that you would be a good history teacher.